Grabbing something to eat on the go for me, is not easy. When I stop somewhere to grab a quick bite all the offerings for breakfast are doughnuts, sugary muffins and pastries. My diet does not include gluten or sugar, therefore, I am constantly on the hunt for recipes that I can just heat up in the toaster oven or pre-pack and go. 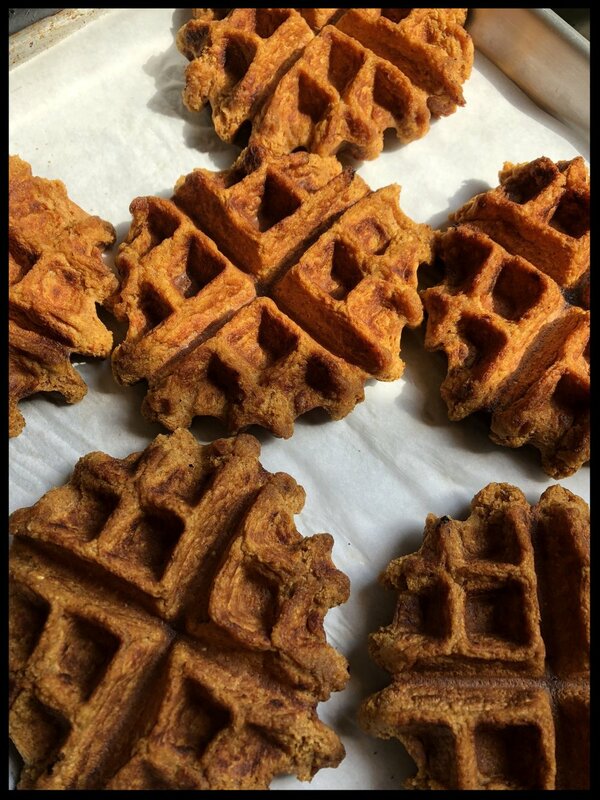 Introducing Oat Waffles, a cross between baked oatmeal, a doughnut and a crispy waffle - pretty awesome. Give it a try and let me know what you think. Make Oat Flour: grind your oats in a food processor until you create a powder/flour. Pour your flour into a medium sized bowl and add your remaining dry ingredients (baking powder, baking soda, salt and cinnamon). In a blender combine sweet potato, nut milk, apple cider vinegar and vanilla, puree until smooth. Fold the wet mixture into the dry ingredients until combined. The batter will be thick. Scoop out 1/3 C of batter and pour into the waffle iron. Bake until golden (according to manufacturer's directions). Mine take about 5-6 minutes to bake. Gently remove the waffles using a fork and place them on the sheet pan in the preheated oven. Finish baking the remaining batter. Serve with your favorite toppings. Maple Syrup, Whipped Cream, Berries, Toasted Pecans!!! Feel free to add a sweetener if you would like. I would say not more than 1-2 tablespoons for the recipe; especially if you are going to be adding toppings that are sweet. To Freeze: Allow the waffles to cool completely. I freeze mine on a parchment paper lined baking sheet. Once frozen, stack one on top of another in a storage container or plastic gallon sized bag - freeze for up to 3 months. I like to freeze mine with wax paper or deli paper in between each waffle so it will not get freezer burned. From the Freezer: Bake at 300F for about 8-10 minutes or until warmed through or toast on the toaster setting in a toaster oven. Keep an eye on them so they don't get too dark. Waffles on their way to the freezer!